Welcome to my madness. This was the impulse buy to end all impulse buys. 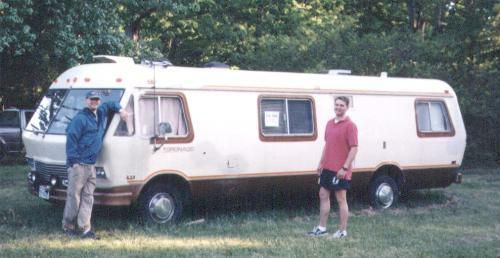 I've always wanted to get an RV and fix it up to be the ultimate roving party machine. I've just never liked the boxy look of most of the ones that I've seen. They either look like a van with a camper parked on top, or like an old school bus. I wanted something funky. When I passed this thing on the side of the road, it was love. It was just quite possibly the most funkadelic looking machine I'd ever seen. 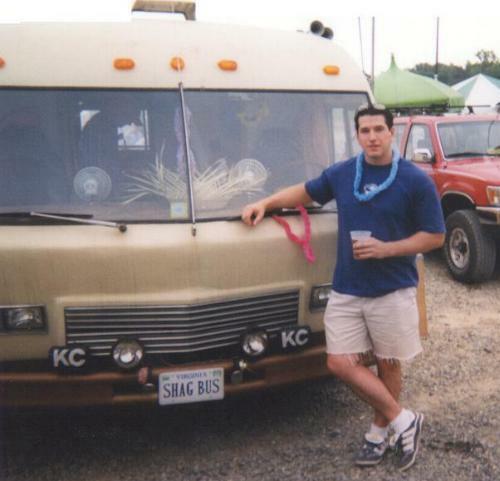 Basically, the idea behind the party bus was to have a vehcile that you can take to concerts and take on road trips, etc. We had great plans for it, my room-mate and I, but the lack of time, and the small amount of use we got out of it, nothing much got done. Besides, it was a cool vehicle to have and drive just like it was. The interior on the thing was actually in pretty decent shape. It would have needed a little work to make it funkadelic, but we were going to try to do it up with the funkiest 70's style we could find. Some nice beads and some disco lights. As for the general condition of the vehicle, it was in great shape. It was well cared for and ran perfectly. Ammenities currently in the bus. 2 couches in the living room, each able to seat 3 or 4. We wanted to outfit it with a nice stereo that thumps, including some subwoofers and some party lights. Disco balls, and strobes, etc. Basically, anything I can find in "spencers" that lights up. Theres also a shower in the rear that looks like it would be difficult to use, so I thought it would be best if it was converted in to a place to store the kegs. 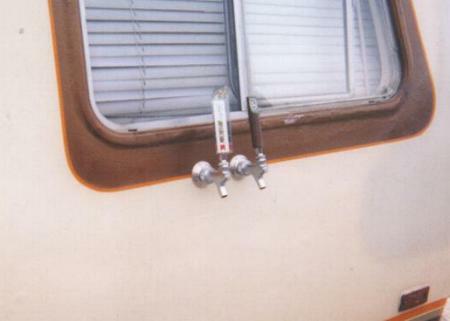 Basically, the space fits 2 kegs, and we were able to drill holes through the side of the RV so that the taps came out the outside as well as the inside. On top of that, I was going to put marine speakers mounted on the outside of the bus, as well as an AV system inside that would have a TV and VCR. How can I rent the Shagbus, and other interesting questions. We were able to install the 21" TV in the front living area and sucessfully turned the shower in to a 2-keg keger-a-tor. There are now two taps that stick out the side and one that is on the inside. It all runs flawlessly off of a CO2 system. The shower has been modified to support the weight and keep about 8 bags of ice around it. Thats my friend Scott holding the bus up. 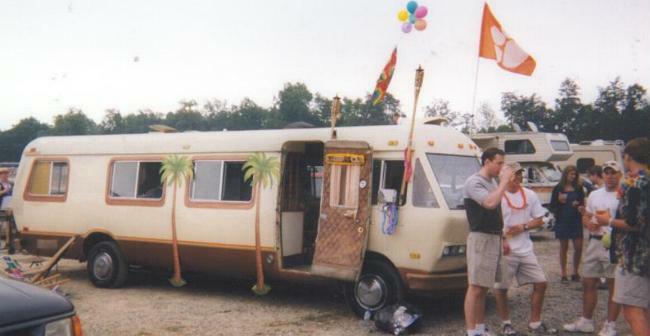 The Bus was an amazing hit on its maiden voyage this weekend to the Jimmy Buffett concert. The way it got dirty, made me realize we need to re-think some of the upgrades we had planned. We were going to try to modernize it, but now the plan had turned to emphasizing the 70's style of the thing. Some photos of when we took the bus Camping, and the only interior shots I have of the bus. Or click here for some fun I had once I made the template to try out paintings.